For today's card, I used Stampin' Up! black cardstock for the base, and the pattern paper is from My Mind Eye, Night Light collection. 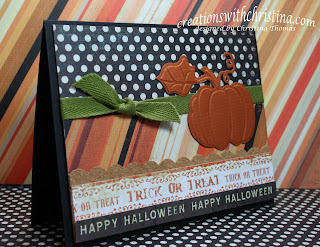 I used a Cuttlebug pumpkin folder, as well as some green ribbon from The Paper Studio. Another added touch is my dear friend TeriB sent me some cork sheets. I used my Fiskar scallop edge punch on the cork and it cut like butter. Have a good week. Love the card. Don't you love that cork!! I love the masculine look of it! The cork really adds to this card. I have "cork" paper but I haven't seen the sheets either. Pretty card, Yeah, I thought the Cricket (Expression) was addicting but I'm getting addicted to the Cuddle Bug too. I'll have to look for the cork sheets thats really pretty. Very nice card! I love the way you put colors together, I am way to matchy, matchy when I pick things out, but when I see your style I always thing.. "Why didn't I think of that?!?!" lol Thanks for sharing.